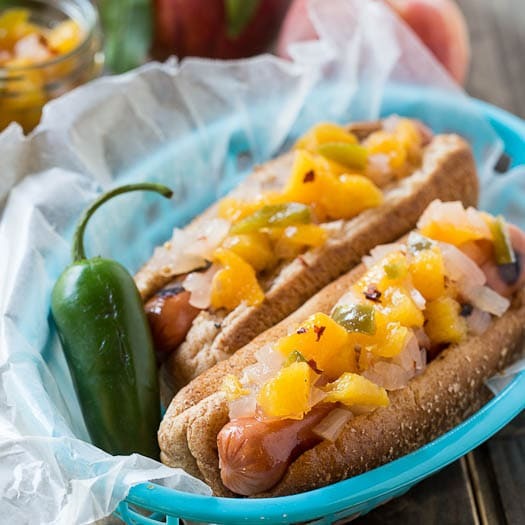 Peach-Vidalia Onion Relish with jalapenos is a sweet and tangy condiment that will take your hot dogs from drab to fab. Great way to use excess summer peaches. Peach season is in full swing in South Carolina and I can’t get enough of them. They are unbelievably sweet and juicy. So juicy they can’t be peeled without a river of juice running down your hands all the way to your elbow. We eat peach cobbler all summer long, but sometimes I like to do something a little savory with peaches too. 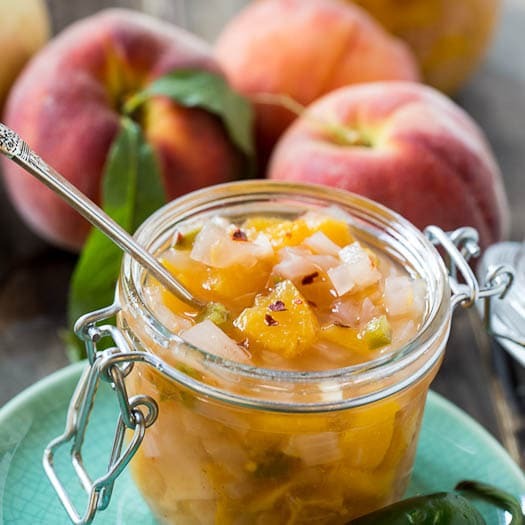 This Peach-Vidalia Onion Relish is packed full of tangy, sweet flavor and is spiced up with jalapenos and crushed red pepper flakes. It also has a splash of gin to help add a little kick. I used Cardinal American Dry Gin which is distilled less than an hour from my house in Kings Mountain, NC- but you can use any gin or even omit the gin. 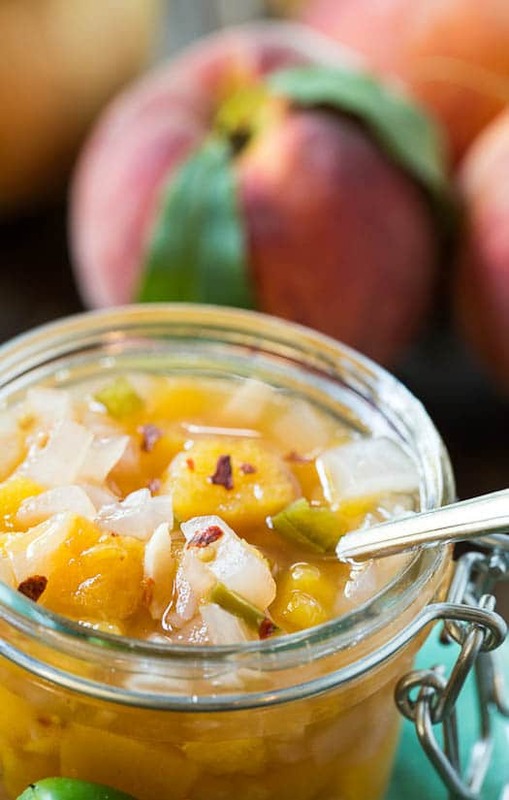 If you have a large quantity of ripe, summer peaches (And I wouldn’t recommend this recipe for peaches that aren’t really ripe) that need to be used up, this is a great recipe to do it with. It makes a large batch of relish which can be refrigerated for up to 2 weeks or it can be canned. 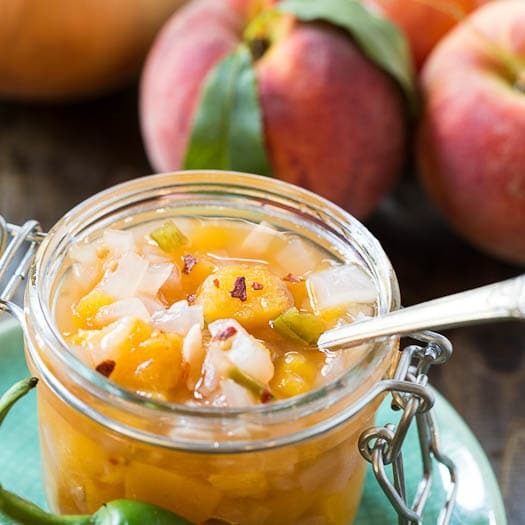 A sweet and tangy peach and Vidalia onion relish that makes a great topping for hot dogs. In a Dutch oven bring water, sugar, cider vinegar, gin, salt, mustard seeds, celery salt, crushed red pepper flakes, and bay leaves to a boil over medium-high heat. Add onion, peaches, garlic, and jalapeno and boil, stirring occasionally, for 15 minutes. This entry was posted in Snacks and tagged peaches, vidalia onion. Bookmark the permalink. You mention it can also be canned – do you have the canning specs? I would love to be able to eat this in the winter! Living in Colorado can be food torture at times. We’re such late bloomers that I have to stand by and watch everyone else enjoying peaches and sweet corn … and it will be another couple of weeks until our crops are here. I love this relish idea. I’ve got Vidalia onions in the basement and hopefully they’ll keep long enough to join our Colorado peaches for this relish. I love the idea of a fresh fruit relish!! And it sounds like it would pair perfectly with salty hot dogs… now I am craving this for dinner tonight!!! Peach season is my favorite and I love how many peaches are packed into this relish! It sounds amazing! I would probably not be able to resist eating this by the spoonful! Oooo what a fancy relish! 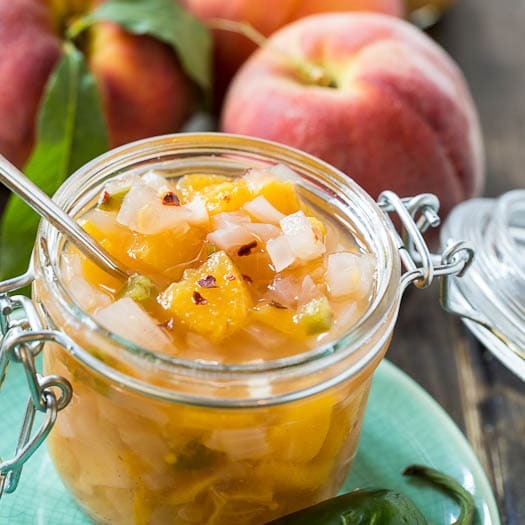 I don’t think I’ve ever tried a relish that included peaches, but I bet their sweetness complements the onions perfectly! I’ll have to give this a try one weekend. 😀 Thanks for the recipe, Christin! I just bought my first flat of peaches yesterday, and now have more peaches than I know what to do with. Best problem ever! Am totally going to use a few to make this relish. Sounds delicious! Ooh, lovely! I’d love to make my own relish some day soon. 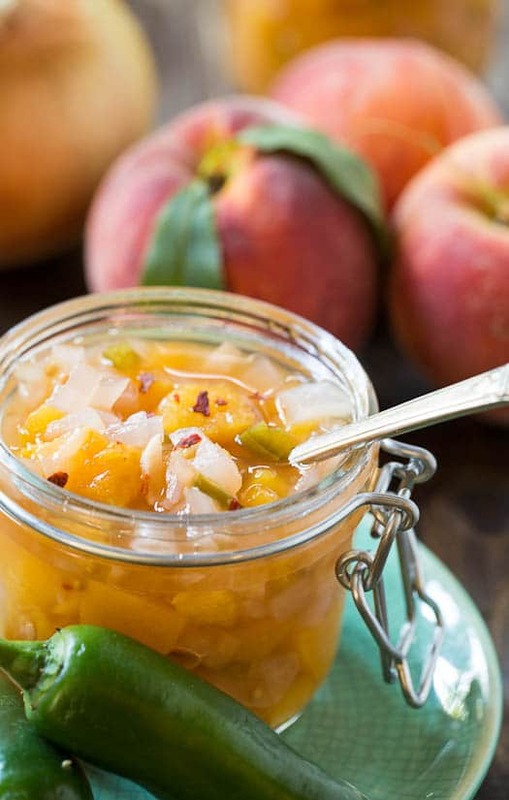 I’ve never seen peach relish but it sounds and looks just amazig. I really do like your idea of spreading this on some cream cheese and eating with crackers. Oh wow, this relish would be good on so many things! I love doing something savory with fruit – don’t get me wrong I still love all the sweet stuff but it just works so well in savory dishes too! This is seriously so inventive and smart!!! Lovin’ all the peach recipes. And I love onion so this is bound to be a winner. Holy moly! I love everything about this recipe!! Peaches, vidalia onions and gin whoa!!! I envy you.. 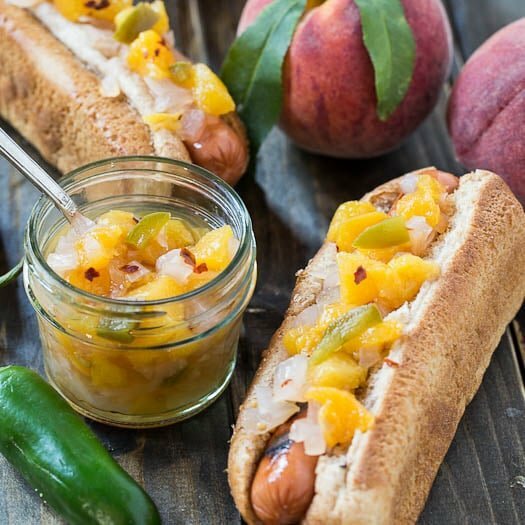 I wish I had peach season 😀 this relish sounds yummy! I would probably have it with chicken.. This looks amazing Christin! I am loving the sound of this – and I love peaches during the summertime! 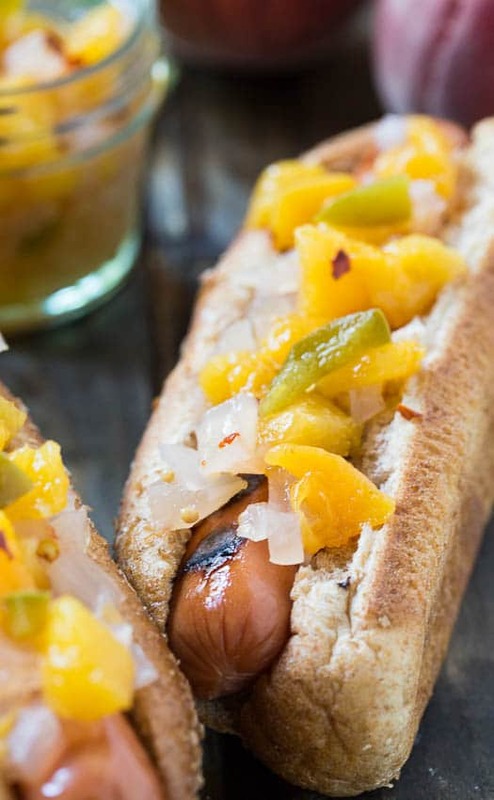 Using it to brighten up and flavor up hot dogs for the summer – brilliant! I love the sound of this relish, Christin! Peaches are so delicious in savory dishes, and I’d love to top a burger or hot dog with this! 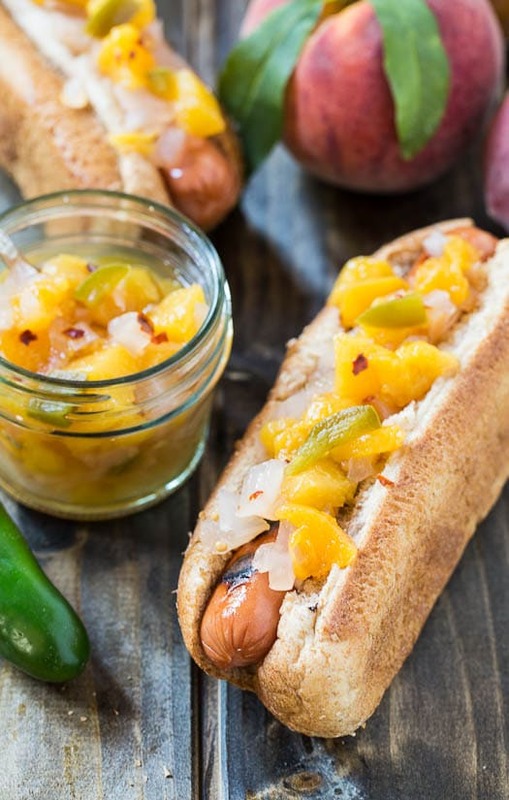 This relish looks amazing, Christin! I absolutely love that you made this with peaches. Fresh and sweet, with a tang from the onions. Looks perfect for the summer!